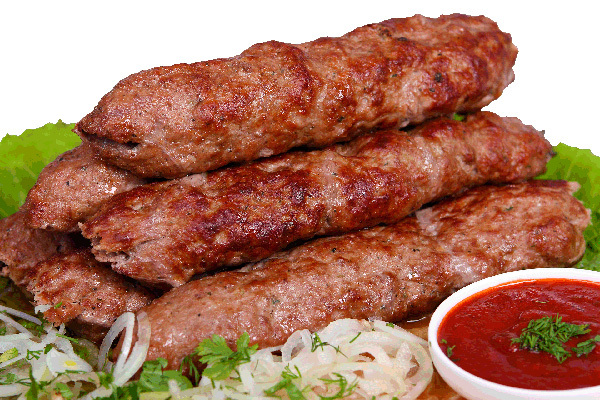 Kebab is one of the perfect dishes for a picnic. There are many recipes of cooking, but the secret of a good lyulya-kebab lies only in one thing - stuffing. It needs to be light and airy. - black pepper, salt to taste. Wash the meat and dry. Clean it from the veins and films. Then cut into small pieces. You can use mutton and beef separately. However, the kebab will taste better and more original if you make it of equal parts lamb and beef. Scroll through the meat grinder together with garlic, onions and pork fat. The latter will give dish a wonderful richness. Meanwhile, the ideal option is to chop the meat for the kebab by hand. This is a laborious process, but it's worth it! Put the resulting stuffing in the gauze, which you must pre-folded in several layers. Squeeze all excess juice. Chop the greens and add it to the meat mixture. Season with ground pepper and salt to taste. Mix everything and put in a couple of hours in the fridge. Then remove and again press all liquid from the meat. Place the sausage meat on the skewers, carefully Ablaev them. Kebab should be in the form of oblong cakes. On a single skewer should be one such cake. Fry the minced meat over hot coals for seven minutes. Every minute turn the skewers. Serve kebab with your favorite sauce and fresh vegetables. This dish is ideal for cucumbers, tomatoes and sauce tkemali.